Making a pinecone fire starter is a fun and easy project that anyone can do. In fact, if you were a girl scout, boy scout or went to summer camp you probably made a few over a campfire. They're easy to make and they work good too! Plus if you add a little coloring and package them in a decorative way they make great gifts. First, you need an old candle or some paraffin wax. Second, you need some string. 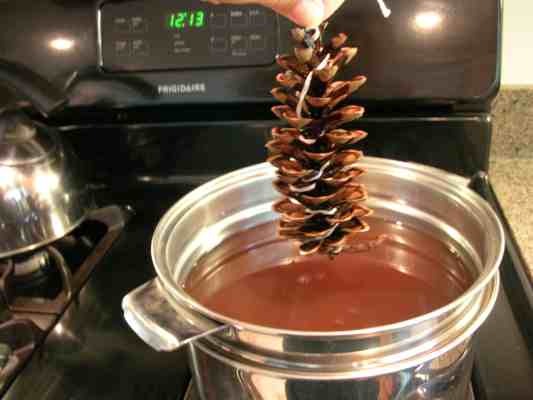 Third, you need a double boiler or coffee can and sauce pan and then finally.......Pinecones! We used an old candle we had laying around for the wax. If you don't have a candle you can purchase soy wax or paraffin wax from your local department store. If you don't have access to a double boiler you can simply use a saucepan and a coffee can. Fill the saucepan about 1/4 full with water and sit the coffee can inside the pan......an easy homemade double boiler! 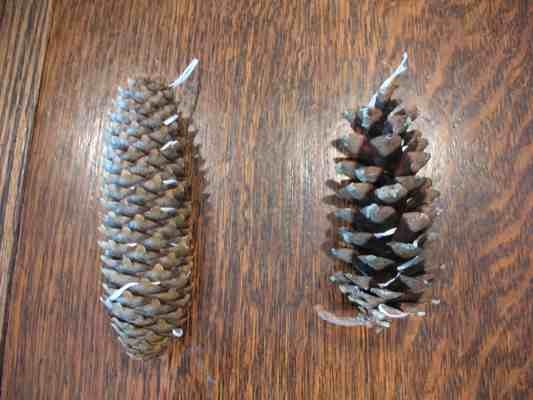 You can use any type of pinecone but pinecones from a white pine (pictured on the right) work great. They have very pronounced ridges which hold the wax really well. 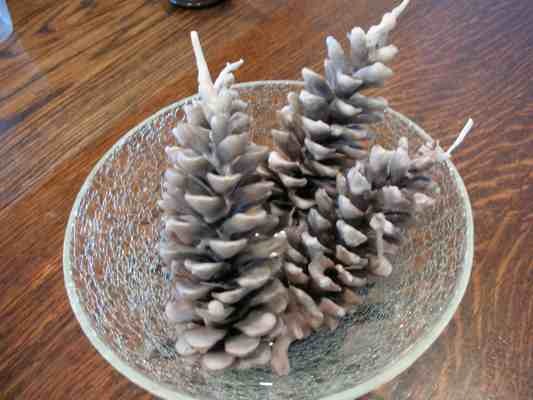 Other types of pinecones with tight, small ridges don't seem to work as well and are not as decorative (pictured on the left). Start by taking string and wrap the pinecone from the bottom up. Make 3-4 wraps around the pinecone and leave about 6-8 inches of string at the top to hold on to when dipping it in the wax. 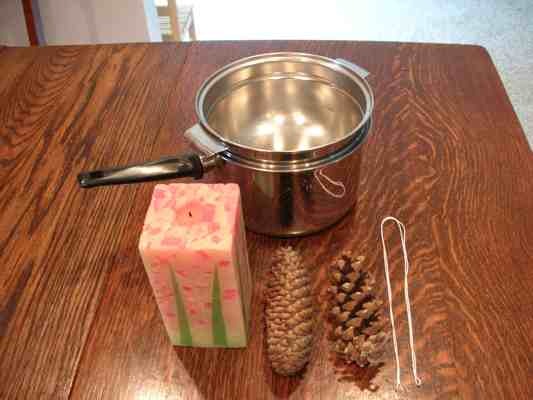 The string serves as a homemade wick and you can light the pinecone just like a candle when you're ready to use it. Fill the double boiler approximately 1/4 full with water and place the candle in the melting dish. Allow the wax to fully melt. The temperature of the wax makes a big difference. If the wax is to hot it's difficult to build up a nice layer of wax on the pinecone. A somewhat cooler wax will stick to the pinecone better. However, don't let the wax get to cool or it will form a skim layer over the top. Once the wax is melted you're ready to dip the pinecone. For safety reasons, it's best to use tongs to hold on to the string when dipping the pinecone into the wax. After dipping the cone allow the wax to dry for about 45 seconds before dipping it again. Repeat this process 3-4 times depending on how much wax you want on the pinecone. That's it....you're done! A pinecone fire starter works great for starting a campfire. Each pine cone will burn for around 10 minutes. To use one simply place it underneath the wood and light the wick. To color the wax use old crayons or dye blocks. If you try to use food coloring it will just sink to the bottom of the wax and it won't mix in. 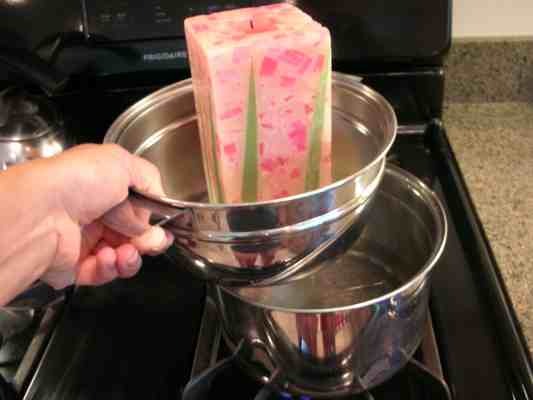 You can also add liquid scent to the wax for a scented fire starter. Remember, hot wax is extremely dangerous. Use caution and protective equipment when you're doing this project.